Room lighting is of great importance. It affects the efficiency of work and learning. In addition, lamps have long been an integral part of the interior. 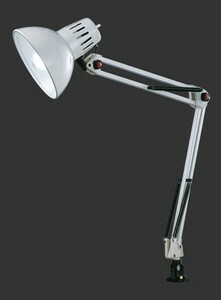 If someone wants to buy a desk lamp for work, he must choose the type and brightness of the lighting. 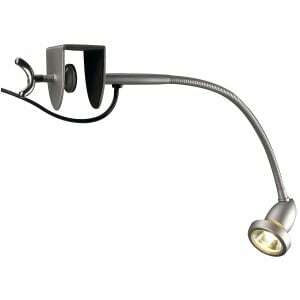 Doctors recommend using lamps with low power consumption up to 60 watts with scattered light. Under these lighting conditions, the eye load will be minimal. Tungsten. The principle of operation of this lamp is as follows: the electric current passes through the fiber. Heats up and emits light. These are so-called low-budget table lamps. Their price is available to everyone. Halogen. They work on a similar principle, only the buffer gas is inside the lamp. The advantage of a halogen bulb is that it disperses the natural radiation spectrum and has a longer life than the table lamps described above. LEDs. 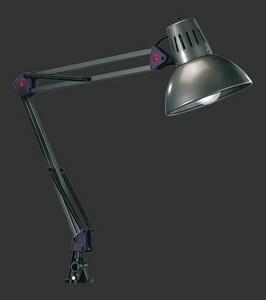 A reliable and energy-saving light source for the work area. Creates comfortable working conditions with documents or at the computer. LEDs practically do not heat up during operation, they are not afraid of shocks, they shine brightly and without flickering. Lighting is an important attribute of home and office. For beginners, students and successful corporate directors in the workplace require high-quality light sources. 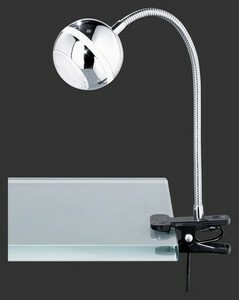 Modern clamping lamps are a classic device, usefulness and durability, included in the original version. 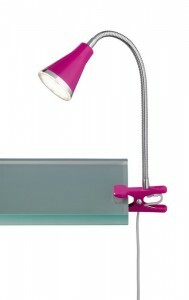 The clamping lamps are designed to be attached to a desk or worktop depending on its purpose. It is a convenient construction because you can direct the light to the desired area, thus achieving an optimal level of lighting. 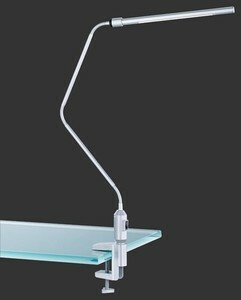 The clamping lamp provides the possibility of moving the light source freely over the table surface, as well as adjusting the lamp height above the table, which gives an optimal level of lighting for all types of work. The new generation of LED terminal lamps gives an optimal level of lighting for all types of work, does not cause visual discomfort, glare and does not create flares and shadows. This type of LED lighting consumes 10 times less energy than its predecessor. 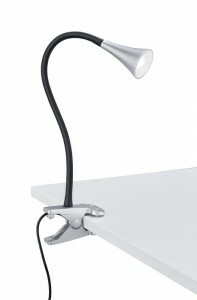 The clamping lamp is an excellent option to work not only for students, but also for designers working at home or in the studio. 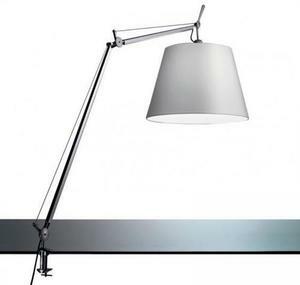 Thanks to the swivel fixing, the lamp is rigidly attached to the surface of the table top and allows the lighting of a fairly large surface, which is particularly convenient when working on large projects including drawings. The silver gray color of the product fits perfectly with any business, youth or student interior. Naturally, the lighting of office rooms and rooms creates a slightly different atmosphere than in the living room. Here you need lighting lamps with the right construction. Office luminaires should fulfill two important functions at the same time: to provide the right level of lighting at the desk, to avoid eye strain and at the same time to match the design of the work room. 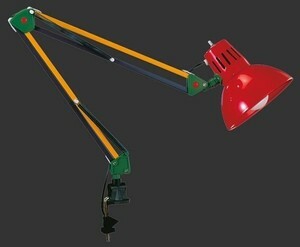 The clamping lamps have a high, high quality and impressive design. 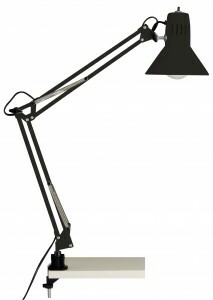 One example is an office terminal lamp ideal for modern interiors. The device is made of a reliable raw material, thanks to the metal construction the user can direct the light source at any angle chosen. 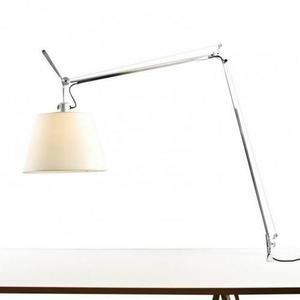 Modern and impressive design and excellent lamp stability will satisfy people even with high aesthetic requirements. Clip lights are usually light and compact. Such lamps can be installed in any position. They take up little space and save the desk space. The benefits provided by the clip lights are: practicality, functionality, good design, reasonable price. 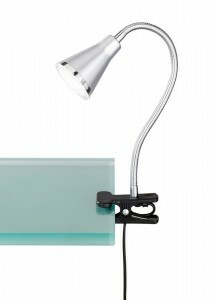 An example of such lighting is a black and silver clip-on lamp having a small size. 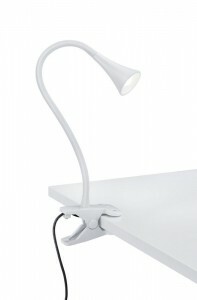 It is the optimal solution to organize lighting at home and in the workplace. It gives a clear purposeful beam of light, which is why it is widely used during reading and writing, working with fine details. 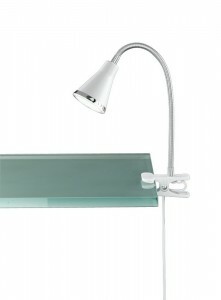 The design provides a comfortable mounting, so it can be safely installed in the right place. 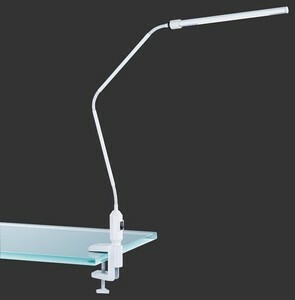 The device has an adjustable diffuser, which allows you to direct the beam in the right direction with a fixed fixture. 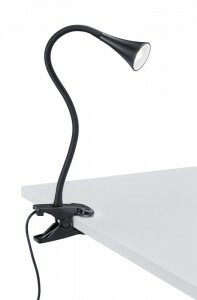 LED clip lamp mounted on the flexible leg, easily bends in any direction, directing the light beam to the right place. 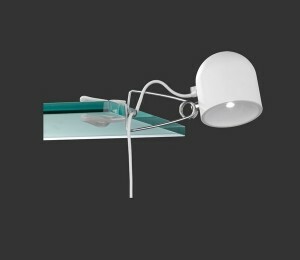 The small clip will securely attach the lamp to the table or shelf, and the economical LED ensures even and bright light. Such a lamp will help when someone wants to read when the house is already asleep. 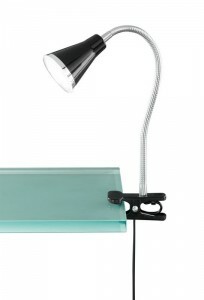 Mobility, practicality and nice design are the advantages of this type of lighting.